I am a bit obsessed when it comes to trying out new products and gadgets for my kitchen. Within the last year, I have replaced many of my leftover/storage containers with GlassLock products from Snapware. 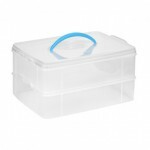 I am a huge fan of these containers – mainly because of the snug lids that snap shut (and prevent spills). Because I am a huge fan of Snapware products, I was thrilled when we were asked to review a variety of products for the Back to School Giveaway Bash. Snapware makes everything from craft and holiday storage, to fun cupcake carriers and more! Snapware products are BPA Free, microwave, dishwasher and freezer safe, air tight, stackable AND Made in the USA. I have been dying to try the Snap ‘N Stack Cupcake Carrier since I laid eyes on it last year, so I was pretty excited to receive this item to review. The Snap ‘N Stack Cupcake Carrier allows you to transport 2 layers of cupcakes with ease….something I have never been able to do in the past! 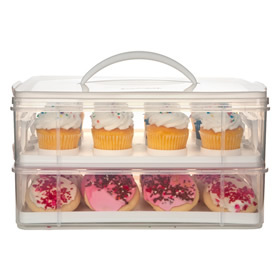 In addition to holding cupcakes, this container can be used to store cookies, cake and more. My 5 year old is starting both Kindergarten and Soccer this year, and I can already see that this product is going to get a lot of use. I was also pretty excited about the Snap ‘N Stack 10×14 Layer Rectangle container. It is the perfect place to store coloring books, notebooks, folders and more. I constantly struggle with organization in my office and with the kids art supplies, and this product is perfect for these items and more. According to the Snapware website “The driving force behind every product Snapware develops is a desire to help you organize your life.” After an incredibly hectic summer (that included moving into a new house), my life could use some organization! Snapware products are going to be a huge help to me as I work to get settled in and start our first year as parents of a school aged child (*sniff*). Also be sure to check out Snapware’s website for more information about their products, and to find a retailer near you. I personally have seen these products at The Container Store and Kroger. You can also find many of their products on Amazon.com. Snapware® Oven-Safe Glasslock™ Containers – new product! Enter my other 2011 Back to School Giveaways here! This post sponsored by Snapware as part of the Win Giveaways 2011 Back to School Giveaway Bash. This post was written by me and was not edited by the sponsor. Read more in my disclosure policy. Find more information on the terms for this giveaway on the Win Giveaways Facebook page. the area of my life that needs the most organized now is … my WHOLE apt! It’s so hard when you live in a small apt to keep anything organized! My kitchen needs the most organizing right now! I just moved into a new apartment last week and have had to buy EVERYTHING so things are a bit crazy. The thing I need organized the most is my “desk” that is covered in piles of coupons! please i adore that cup cake holder too. i like to buy in bulk but say for instance cucakes buy a huge boful at costco freeze in box tastes lousy when defrosted, need food freezing organizing thank you !!!!!!!!! I am starting a little bakery business out of my home kitchen, and I could really use some extra kitchen organization. Perfect for Snapware! Our home office is greatly in need of organization! I subscribe to your RSS feed. I love the deals! EVERY area of my life needs organizing, but if I had to pick one, I’d say that papers piled everywhere is what drives me the craziest and is the hardest area for me to tackle. Help! Our home office; the paperwork has taken over! My whole life needs organized. The main thing would be the papers that seem to multiply everywhere. My kitchen needs the most organizing! It’s too small for all of our stuff, plus not having a pantry adds to the chaos. My kids game cabinet needs the most organizing right now. I’m following on twitter and tweeted about the giveaway. I already follow you on facebook. I shared the giveaway on my page. My kitchen “junk drawer”. It is the collect all drawer for kitchen gadgets. My classroom! We start school around here in a week! I need my kitchen counter organized, it’s the catch all for everything! Everything needs to be organized! My kitchen keeps getting unorganized to much stuff and not enough places to put it. Every area of my life could use some organizational help, but the paper clutter is doing me in. The part of my life that needs the most help organizing is our office/computer/filing area. It is a work in progress. I subscribe to your e-mail newsletter. Thanks for all of the tips! What doesn’t? But I will have to say my daughters room it just isn’t working for me anymore. My new kitchen needs an organizational re-haul! With weird, random cabinets and little counter room, I have to make use of every single square inch! My closet is in desperate need of some organization! I need to go through and get rid of old clothes desperately. My schoolwork and my home office needs organization! Would love to win this prize. Thanks for all your great ideas!! I meant to say my kids’ schoolwork and art supplies. The area in my life that needs the most organizing is toys/clothes. I like you on Facebook and promoted the giveaway. Kids crayons/coloring books, etc. Now that I read about the 10×14 container, I really want to get one! It would be perfect! I think I need organization in every area of my life right now!! Probably the one I would start with would be my kids school stuff (papers, art work, supplies etc.). Love this! A lot of things need organizing. As someone correctly said its tough to keep things straight in a small apartment. But to begin with it would be papers, medicines and photos on my laptop. I NEED HELP! I have 3 kids in high school with one a senior. And I am starting a new job! I have paperwork all over the place from my job and his college applications! I could use these to organize my desk and for transportation of snacks to my daughters cheer team! I would use these items daily! I’m moving and would like a freshly organized new apartment. My pantry needs major organization!! My craft room needs the most help currently. I would say my kitchen because it’s so small and I have so much stuff for cooking! Thanks for the chance. I need help organizing my bedroom. It continues to be a dump all. Kids arts and crafts supplies are in desperate need of organization! And my sewing stuff, too. I like Stretching a Buck! Just shared this on my FB wall! Tweet about this giveaway on Twitter…done!!! My home life needs organizing. My garage needs a lot of organizing right now. Too many toys/tools and no where to put them. My kitchen needs the most organizing and I love to organize. I love this cupcake organizer. With grandchildren, they are all having birthday parties and this would be great for them to take their treats to school in! I need to organize my pantry. I would love to win this!! my school supplies and room.. working on it today! My kitchen is really needing an upgrade in organization. I have been working on it a little at a time. I would really LOVE to win this! Everything in my life is unorganized! I used to think I was one of the most organized people I knew. Then came a husband 2 wonderful step-daughters and a 2 year old. My daughters are very athletic, Softball and Basketball. So this would help GREATLY with team treats! I only Facebook so and already like the page! I will go back and share it! My closet needs a lot of help. Most of my clothes are stacked in and around the room, instead of in the closet where they belong! Subscribed to email feed burner. My office area needs to be more organized! The area that needs the most organizing is my kids’ stuff! I have twin 5 year olds, and I can’t believe how much stuff they have!!! I have several areas that need organizing! But I’d say the kitchen and the office areas are the worst. The area of my life that needs the most organizing right now is my work life as I am a teacher and preparing to start back to school. In my kitchenis where this will help the most! I send home food and goodies to my son, who is in the Army and is based a hour away! My hall closet needs some serious organizing right now. My recipes could really use a good bit of organization. I need to find a system to get them all in place! I need the most help organizing my craft supplies. These supplies seem to be everywhere, in my closet, in the spare bedroom, in my daughter’s room and even in the dining room. EVERY area of my life and home needs reorganizing!!!!!!! I am a facebook fan, Promoted this giveaway, am commenting on your site, and I must say the part in my life that could use an organization revamp is my office/craft supplies!! I am also a newsletter subscriber! I really need to organize the home office! I’ve made good headway with the kitchen but the office looks so sad! The cupcake carrier would be ideal! I love to bake and bring items in to work! And they love cupcakes around here! First year homeschooling, and I need help organizing all the homeschool supplies and papers/projects/art supplies! I’m a new subscriber to your site & love it already! I definitely need to start in my kitchen to get it organized & this giveaway would certainly help with getting rid of the old, worn out containers! Thanks! Right now my finances are in most need of organization. My craft area and my finances are in most need of organizational help!! I would love to try these products!! You should see my closet! Definitely need to organize there! Home office is in need of some organization…. working on it now, but it is only a matter of time until it is a pile of paper again! The main area that’s a mess right now is our schoolroom/office…it’s a work in progress! I need to have my home office more organized. I Love that cupcake holder. I would love to have that! But I really need to organize all parts of my life.From coupons,to pictures,make-up. Hair bows.Just about every where! Thanks! I need some help organizing my office. I have a scrapbook/craft/computer room that desperately needs organizing. I don’t even like going into that room bc of all the chaos!! My closets need serious help! the kids have outgrown their clothes, the baby still has the big kids stuff in her closet and my stiff is crammed everywhere! I follow you on an RSS Feed! The area that needs most organizing in my life would be the three cabinets in my kitchen taken over by my 10 month old son’s formula, baby food, snacks, bottles, sippy cups, pacifiers, bibs, spoons, bowls, and of course puffy cheetos ;) It’s quite overwhelming. My bedroom closet needs to be more organized. I keep part of my stockpile in it and it is hard to keep everything in a neat order. We just had a baby 3 months ago, and I never could have imagined all of the stuff that they have. Between desperately needing to get baby stuff organized, and my quickly growing couponing addiction, I (as a self-proclaimed organizing junky, new mom, new couponer, and baker) could definitely use some extra organizing help! I make jewelry for fun and a little bit of money! I am always looking for ways to get better organized in my little studio. I have such a little amount of space dedicated to jewelry making that I need to make really good use of it! My linen closets! I had company over and it took an embarassing long time to find the right size sheets, blankets, and extra towels-eek! I need to organize my kitchen…my cupboards are so messy i have to keep my dinnerware on the counter. I need my kitchen organized for sure! My house needs more organization! My husband is the one who finds all of your deals on line for me (he’s the computer whiz!) Just about every room in my house could use a little organization in one way or another but if I had to pick one…it would be my kitchen! It’s the heart of our home :-) I LOVE to cook and who doesn’t LOVE to eat?!? Thanks for the chance to try something new!! LOVE THIS CUPCAKE HOLDER!! Amazing! The area in my home that needs organization help is my pantry (3 deep shelves inside a cabinet), and our kitchen island where we drop mail…and everything else. My children and all the school items they need. UGH. I need to organize my classroom as I get ready for the 2011-2012 school year! I also subscribe to your email and I “like” you on facebook. My office / craft room needs the most organizational help! I would love to organize my kitchen with the Snapware products. Awesome! My desk area needs some help right now. My kitchen cabinets are in serious need of organization! I can keep up with the laundry but I fall behind with the ironing. I can keep up with the mail but I fall behind paying the bills. Too many magazines in the rack. I forget where I put birthday cards etc and when the time comes to mail them I can’t find them. I can keep up with cooking but I fall behind finding containers to put the food away. My refrigerator is clutter with used margarine containers – they all look alike and I forget what is in them. I try to pride myself with organization but I am a failure right now! thanks for listening. i can really use some help organizing my closets. All of them. They’re a mess!! And i would really really love to win this awesome prize! thanks for the opportunity. we just moved into a new home; basically everything needs organized. mostly my closet! What area of my life does not need organizing? That is the question. my desk needs the most organizing…it’s ever evolving!! my ktichen needs BPA free products….help! I need to organize my kitchen, just had a baby and it really needs it bad!! The under the stairs closet! My sewing area could use some organization. I’m not sure how this ties together but the cupcake carrier is fantastic! School supplies need major organizing! My closet is what needs organized the most! I’m going back to school so EVERYTHING could use reorganizing, especially my desk area! My entire house needs to be organized….but I will start with the kids rooms and their toys! I subscribe to your feed and follow you on facebook + shared this giveaway. These would come in handy when kitchen is finished with remodel and I start to reorganize. The area of my life that most needs organization is always the same – The Kitchen! I already like you on FB, I shared the giveaway on my page. I need to organize the endless supplies of paper that are getting ready to consume my home with the start of a new school year!!! i also receive your daily email!!!! my desk needs to be organized, its terrible i have so much on it that i cant find anything! i need to organize all of my pantry. I need help organizing my craft supplies. The airtight food storage containers would be perfect for bringing food to campus for my 12+ hour days! It is always paperwork that needs organized the most in my house. Always seem to fall behind with the mail etc. and not looking forward to all the papers that will be coming home from school next month! I need so much help in my kitchen! I am in the process of trying to organize the shelves, plastic storage, kitchenware, etc. the project seems unending. I really like the snapware glass containers, I really would like to eventually exchange my plasticware for glass snapware. Since I am on disability, this is be one container at a time. Kind of like how I got my college degree, once class at a time, paying cash a long the way. It was well worth it and so will this. Eventually, my kitchen will be organized!. Love your website and thanks for the daily savings emails. My room and my coupon stash both need to be organized a lot! my whole kitchen! we just moved! The area of the most help is my coupons and papers. My basement needs a lot of organization! I could really use this to organize my daughters art supplies! And I love the cupcake holder. Great idea! I need to organize my pantry! I need organizing in all areas especially when it comes to paperwork. I like you on facebook. I promoted your giveaways on my wall. thanks. I need to get my kitchen organized as everything seems to get dumped there and it’s always a challenge keeping it organized. The area I really need to organize right now is my kitchen & the rest of my home life. My kitchen counter needs help. Everyone puts everything on it. My computer area needs the most help. It’s where I keep all of my couponing items, and it’s out of control! I need to organize my kitchen. The shelves & drawers are quite a mess! I am a subscriber to your feed via email and LOVE you on facebook! My office needs the most organizing right now. my kitchen needs the most organizing and i love the cupcake holder. Our kitchen needs the most organization now. I have so many round bowls and storage containers that our fridge is always full yet there is so much more room if I had different containers. My kitchen needs the most organizing for sure. Area of my life that needs organizing…Well, I do have a baby coming in 2 mos and haven’t started on her room/clothes, etc. That’s probably a good place to start. I LOVE Snapware. We’re trying to get our house on the market and I’m finding I really need ways to organize my kitchen so that it will be easy to maintain. I already subscribe to your blog via RSS feeds. My kitchen needs the most organizing right now. My daughter’s toys need the most organization right now…they are everywhere!! 6 kids and always on the go……. The area in my life that needs organizing…. my kitchen cupboards. Too many bowls/cups/plates that don’t stack nicely together. Thanks for your giveaway contest!! So fun! I am a newsletter subscriber also – read it everyday! Thanks again! My bedroom needs some organization right now! I need as much organization as possible in my life, I guess if I had to pick I would pick my bedroom. I need to organize my closet and really purge my clothes and shoes! Wow thoes look so cool, at my house this back to school time with school supplies everywhere is hairpulling,it would be great to have some cool new storeage boxes and goodie holders. Thanks for your blog I look at it daily and I am a subscriber. I love being organized.. my area in need of improvement right now would be school books.. but those may not fit in those containers.. otherwise it would be craft supplies. Thanks!!!! My granddaughters’ closets need organized as we start to get ready for back to school. Last time that I’ve had a 3rd grader was many years ago. my craft closet and my tupperware container cabinet. i need help organizing my crazy family’s schedules! I really, really need the Cupcake Layer carrier!!!! It would make it so much easier to take the cupcakes to girls’ school…As for the help, I need to know how to get everyone to put stuff back where it belongs. My kitchen needs the most organizing. My calendar!! There are not enough hours in the day! mail that comes in need organizing help big time. It may be easier for me to say… what area of my life doesn’t need organizing!! However, the cupcake carrier looks awesome!! Thanks for a chance!! I would like to be more organized in the kitchen. When I open the cabinet door, the containers come tumbling out. My entire house needs to be reorganized to get ready for baby’s arrival this winter. Definitely my kitchen. There is hardly any storage space and I would love to get it in order. I need help organizing my scrapbook supplies. I like SaB on FB! I sub to your feed! My kitchen could use some organizing…snapware would help a lot! My kitchen needs organized. It is driving me crazy! I need to organize my plans and commitments better! My kitchen needs an overhaul! My bedroom could really use some help! I could really use some help with organizing my basement! It seems to always be in a state of chaos. But with school about to start, organizing my kitchen is a top priority:) I would love to win this giveaway!!! I already “like” you on facebook, but I just posted the giveaway in my status. I could really use the help in my kids’ playroom! …and I “liked” you on facebook! Our laundry room needs serious organizing. My homeschool room needs the most organization right now! However, I could always use new leftover storage. Thanks! I could really use this. Email subscriber. I would have to say my kitchen….I love to cook and bake for anyone and everyone and have to have all of the newest gadgets to share with others. I need to organize my finances. I liked you on fb (Moey Shay). Our whole house needs organizing, but I guess I would have to say my kitchen as that seems to be hub of our home. I also like you on face book! I need help for the whole house, especially the game room and living room! My kitchen island and my desk. Paperwork! My school life definitely needs organizing right now. my pantry needs to be organized. I opened it the other day and an oatmeal container fell out and oats were everywhere. my kitchen needs to be organized. we have so many kinds of containers to store stuff and I can never find the right lid. my computer desk needs organizing right now! My pantry is in desperate need of organization! All areas of my life need organizing! Well, I better start with the kids’ homework, paperwork, etc. before it gets even more unmanageable! I’m in between living arrangements right now, so EVERYTHING needs organized! My whole apartment is in one room right now. =/ I can’t wait to move into my new apartment and get organized again! My filing cabinet is a mess of papers right now… everytime I sit down to organize it, I get overwhelmed and don’t end up doing it. My stockpile room needs some major organization! I’m a fan of Stretching a Buck on facebook. clutter is getting the best of me. I need to organize my couponing efforts and stockpile. I need help organizing my growing stockpile. My children’s school supplies need some organization. My kid’s rooms need to be organized. I need help organizing all these toys! Too many small parts that easily get lost. I am a facebook fan, thankyou! I really need to organize my DESK! I think my house needs to get organized in a much better manner. I would say all the various papers in my house is what needs organized most right now. My kitchen and basement are in need of organization. I am an email follower of yours. I struggle with paperwork and meal planning. I could use this to organize all of my dried herbs I’m going to get from the garden this year! My desk could use some help! My kids’ playroom needs a major overhaul!! my kitchen needs to be organized!! My whole life needs organized. I have a baby on the way- enough said? My kitchen & my computer room could use some major organization right now! I like you & follow you on facebook. I get you newletters & updates via email on my home email address. The Bedrooms including the kids toys oh… and the the Kitchen, and the bathroom, everywhere. My plastic bowls cupboard needs some serious organizational help. They are always falling out and it is so hard to find matching lids or the right size bowls. Even the kids are complaining about it!! We need the most organization in the office area! My pantry needs organizing which includes numerous items for baking goodies for my kids classes. I subscribe to your email and “like” you on facebook! I need to organize the craft room and my desk! I need more organization on my desk! Right now I would say my cabinets! I have very limits cabinet space so everything seems to spill out everywhere when go shopping. My bedroom needs organizing! It is overrun with stuff right now. my desk needs a ton of organization. Any and all papers in our house! My kitchen table! Why is it that everything lands there? I definitely need to organize my bedroom dresser! My world, I have five kids 10 and under oldeest 4 heading to school Wed. Need to get everything organized for them. My kitchen table! I don’t know how it happens but I alway struggle with organization there.